New York, NY — Today, the New York Metropolitan Transit Authority (MTA) allowed comedic ads about American Muslims to go up in the subway system. The ads, created by Muslim comedians Negin Farsad and Dean Obeidallah use humor to dispel myths and promote understanding about the American Muslim community. The ads were banned by the MTA under policies that restrict “disputed” political speech. 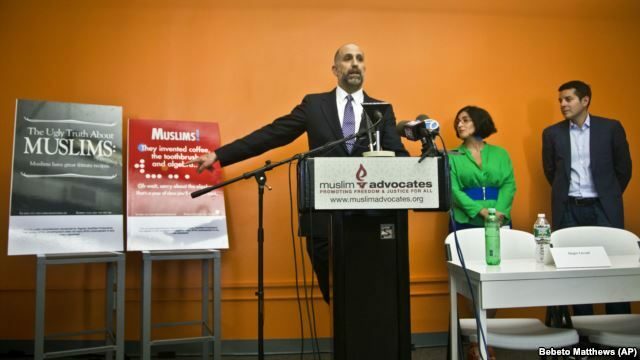 In June 2015, Muslim Advocates filed a lawsuit on behalf of Vaguely Qualified Productions (VQP), the production company that created the ads, challenging the MTA’s refusal to run them. In October 2015, the court ruled that being Muslim is not political and paved the way for the ads to go up. The ads run in the midst of a growing climate of anti-Muslim bigotry and hate across the country. Muslim Advocates has been tracking the spike in hate crimes targeting the American Muslims in recent months. “We’re thrilled that finally our posters will go up and people will start loving Muslims!” said Dean Obeidallah, Comedian and Co-Director with Farsad of The Muslims are Coming!, the film the ads were designed to promote. “Okay, maybe one poster can’t make you actually love Muslims but perhaps it will be part of the courting process,” joked Obeidallah, host of SiriusXM radio’s The Dean Obeidallah Show. Latham & Watkins LLP and Muslim Advocates served as co-counsel in the lawsuit filed on behalf of VQP, an award-winning video production company based in New York, NY. VQP makes viral video campaigns, TV and web shows, as well as narrative and documentary features, and specializes in comedy. Read the court’s decision here and our original complaint here. Muslim Advocates is a national legal advocacy and educational organization working on the frontlines of civil rights to guarantee freedom and justice for Americans of all faiths. Through high impact lawsuits, policy advocacy, and community education, Muslim Advocates serves as a resource to empower communities and ensures that the American Muslim community is heard by the courts and leaders at the highest level of government. Visit Muslim Advocates at http://www.muslimadvocates.org and follow @muslimadvocates.